Felix O’Hare & Co Ltd is proud to have been appointed main contractor to carry out the development works for a new school at the St Joseph’s Convent PS on Catherine Street in Newry. The Education Minister, John O’Dowd cut the first sod to mark the start of new building work in December, and construction of the new 14 class-base premises for the school is well underway. The new facilities will deliver a modern, progressive learning environment for the school’s 400-plus children – a multi-purpose hall, library and reading areas, shared spaces, play areas, all in a bright, open, contemporary style. 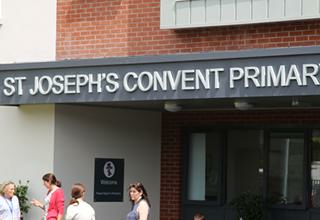 St Joseph’s has been part of the educational fabric of Newry in one form or another for over 150 years. During this time it has adapted to the changing needs of the local community and now, with a new building to come, the school can look forward to an exciting new era.